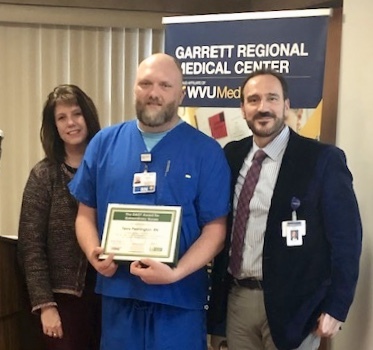 During Garrett Regional Medical Center’s (GRMC) annual employee recognition ceremony, Terry Pennington, RN, received the hospital’s quarterly DAISY Award for Extraordinary Nurses®. Kendra Thayer, GRMC Senior Vice President and Chief Nursing and Mark Boucot, GRMC CEO & President present the Daisy Award to Terry Pennington, RN, who is pictured center. According to the nomination, Mr. Pennington helped put the young patient at ease by conversing with her about her favorite activities, allowing her to have her stuffed animal during the procedure and having a glass of water for her to drink at the end of the procedure. To this day, the child still asks her parents about the nurse at the hospital who befriended her. 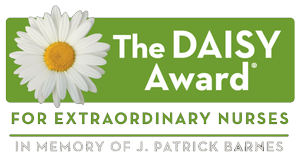 The DAISY Award program, launched in 2018 at GRMC, was created by the Daisy Foundation with the mission of recognizing the extraordinary, compassionate care that nurses provide patients and families every day. More than 2,000 health care organizations nationally participate in the award program. A selection committee comprised of GRMC nurses reviews the nominees through a blind selection process and scores each nominee based upon a scoring rubric sanctioned by the Daisy Foundation. Terry Pennington is a registered nurse and graduate of Allegany College of Maryland. He has worked at GRMC for five years and currently works within the surgical unit. Mr. Pennington resides with his family in Mount Storm, W.Va. and enjoys spending time with his four children. Outside of work, he enjoys coaching basketball and church activities. 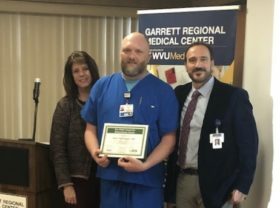 GRMC recognizes a DAISY recipient on a quarterly basis. Nurses may be nominated by patients, patient families, or colleagues. Forms are available on GRMC’s website at https://www.grmc-wvumedicine.org.